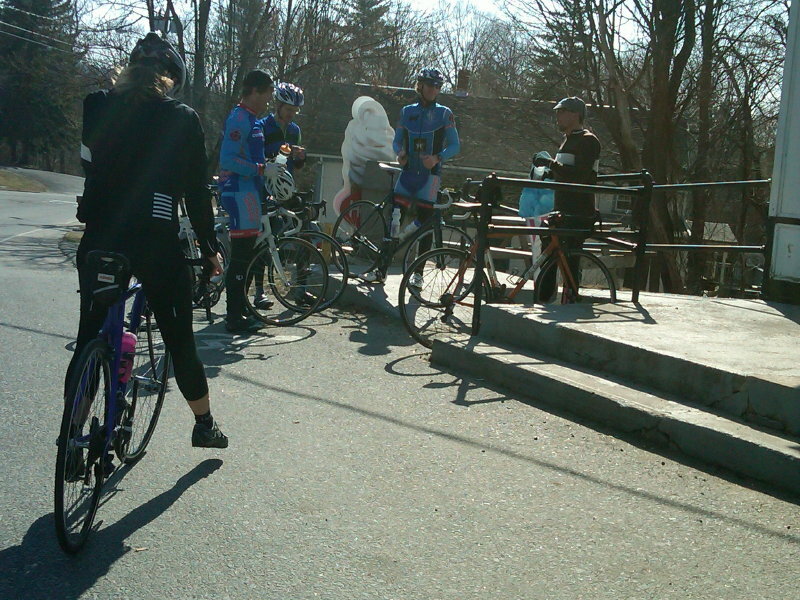 My most recent long ride was a 60 mile trek out to Granville, Massachusetts in stunning, early spring weather. Just a few months ago, I did the same ride, with the same collection of great friends, on a much colder day (see earlier post: Winter Riding). In January, we set out in temperatures in the twenties and returned with the temperatures just a few degrees higher. 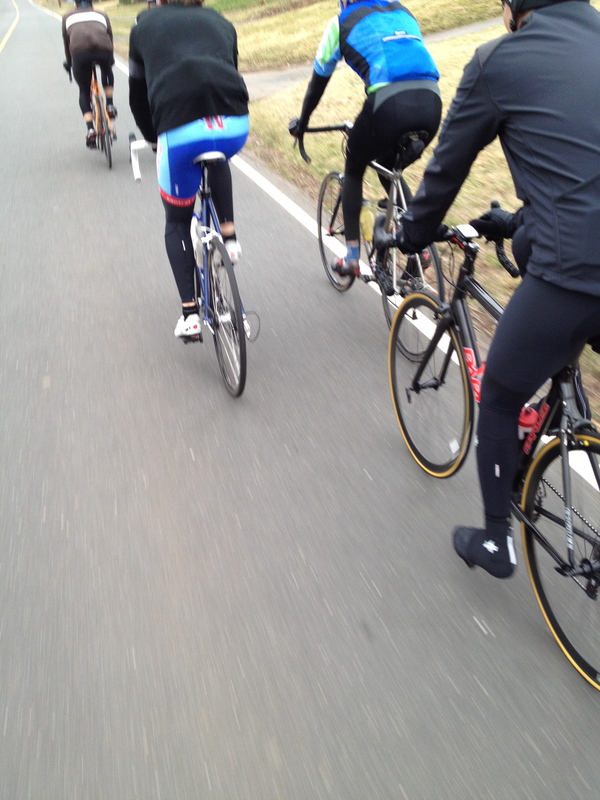 In March, the ride began around the 40 degree mark, still cold, but ended with temperatures near or at sixty degrees. Along the way layers came off, arms got some sun and the taste of the coming season brought a freedom that only lives in our minds in the winter. On this beautiful ride in March, we didn’t sit inside to warm up once we reached the Granville Market, I didn’t even drink coffee, and I love coffee. We stayed outside and it was water for everybody all around. We filled water bottles and passed the time in the sun. The ride also brought this for me: We took a detour somewhere, making the ride a little longer than it might have been, turning 50 miles into 60, but easily so, nobody sweating and nobody complaining, the day is so good. What’s not to like? Why not put in the more miles? We travel more scenic routes than usual and there is a bigger hill climb, too. I have already been laughing and having a great time on my bike for awhile when I see a horse in the distance crossing the road. It’s so far down the road that I can’t see that someone has it on a lead, that it is not actually just wandering around, and that it won’t be running along with us. But for just a few seconds, I thought that might be a possibility, that the horse had gotten free and was just roaming around the street and land. I wondered in those seconds about all of the potentially dangerous things that could happen with this horse being on the loose, but I also thought about how incredible it would be to have the horse running and racing along in the road with us. There was the strangeness of the intersection, too–bicyclists meet horse, horse meet bicyclists, ballerina meet horse, horse meet ballerina. Degas paintings started crashing around in my head in a spectacular but far more modernized way (no tutu for me thanks, just some cool Rapha-wear). The gap between us and the horse started closing, and as it did a person leading the horse became visible, the thin line of a tether appeared and then the horse went into a corral and the person closed the gate. Finally, we came to the fence behind which was this animal. The horse surged. There was a fantastic breath of force, a few giant hoof beats on the dirt, tail flying. It was almost as good as the dream of having it roaming free on the road–horse racing all of us on our beautiful bicycles, ballerina mindset in the midst. Animal, machines, human beings, hearts pounding madly.